They Say: Burn Jew! But The Eternal Jew Rises Like the Phoenix. Nebuchadnezzar burned them, the Crusaders burned them, and even Hitler and Nazism burned them. Is burning the only solution for the Jews? They can smile with arrogant self-satisfaction and think that they have the upper hand on us Jews. However, this interview only reminded me of how the Jewish people are eternal, like the phoenix rising from the ashes time after time. This thought led me to consider whether or not the idea of the phoenix is consistent with Judaism and I came across a fascinating videotaped lesson on the discovery of the phoenix in Noah’s ark (the discussion specific to the phoenix begins at 0:32 minutes). As Rabbi Mendel Kaplan explains, the phoenix was the only animal of creation who did not eat of the Tree of Knowledge. As a result the bird was destined not to experience death. On Noah’s ark, the phoenix (in Hebrew, Chol or Avarshina), unlike the rest of the animals, did not ask for food, telling Noah that he (the bird) saw how hard Noah was working and did not want to burden him further. For this consideration, Noah blessed the bird with eternal life. The phoenix could not be killed, and on a regular basis, every thousand years it appears, it would be burned to ashes only to come to life once more: perfectly formed, strong and invincible. According to some Jewish texts, there is only one “copy” of this bird. Interestingly, it was granted eternal life on two occasions: first, when it obeyed God and did not partake of the forbidden fruit; and second, when it was sensitive to its environment and acted from a position of kindness and consideration. Is this possibly a metaphor for the Jewish people? A singular people, we have been repeatedly burned, as the two learned Egyptians in the video above so happily point out, and our “ashes” spread across the globe. However, what these gentlemen ignore is the fact that each time we are burned, we also experience a subsequent revival, coming to life anew and returning to our nest to reassert ourselves, proud and with our heads held high. If we are like a phoenix, then we cannot be killed. Individual Jews can, of course, be murdered, but the Jewish People is eternal. Perhaps. 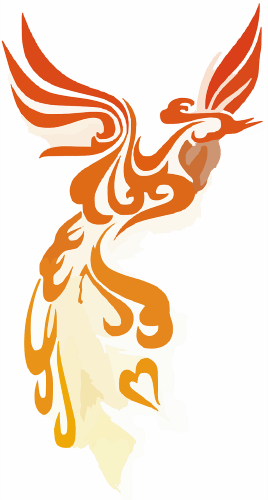 There is another message in Rabbi Kaplan’s discussion of the phoenix – the blessings it received for eternal life were related to two elements: the first, obeying God, and the second, showing kindness and consideration. These two aspects seem related to two concepts that Yael Shahar discusses when considering this week’s parasha, Veyera, that I read only a few hours ago; namely, justice and charity. If we, as a people, can maintain a balance between justice and charity then we surely are the phoenix. If justice is of the mind and charity is of the heart, then these two elements are both antagonistic to each other at the same time as they are complementary. I think it is the tension between justice and charity that causes us, as a people, to be at odds among ourselves. But that might turn out okay if we are the phoenix. I didn’t hear Rabbi Kaplan say anything about whether or not the phoenix changes in any way each time it is burned and rises again from the ashes but I will allow myself the luxury of assuming that each new revival provides the opportunity for improvement. So laugh at the eternal Jew, Prof Zidan and Dr Khaled! Laugh away. A fascinating connection–the Jewish people and the Phoenix. Not an idea that I had heard before, but you make the linkage seem very apt! In his book, The Dawn, Yoram Hazony argues that the qualities of justice and righteousness which Avraham was to pass on to his descendants grant a sort immunity against the usual dissolution of nations, and that so long as we “breed true” in a cultural sense, we will be around as long as human life persists. Well, seems to be right. Looks like we and a few other indigenous nations on this troubled globe of ours have quite the longevity. They Say: Burn Jew! But We Rise Like the Phoenix.